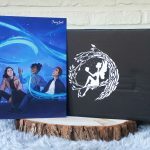 It’s the second week of April and that means it’s time to share my unboxing of the March 2019 Fairyloot box! This time it’s a bit later than usual because the box itself shipped later and it took longer to get here (I think we all know the pain of checking a tracking number and not seeing the package move for a few days, right?). But it’s here now, so let’s take a look! This box marks Fairyloot’s third anniversary. To celebrate, the box itself is purple instead of its usual black. And the theme, “favourites”, is such a great choice! We start, as always, with the spoiler card that features artwork by Taratjah. I love this illustration, although I have to confess I don’t quite see how this fits the “favourites” theme…? 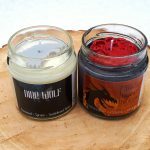 Anyway, on to the first item of the March 2019 Fairyloot! We start with a gorgeous scarf! 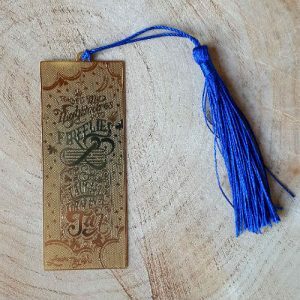 It’s designed by Cara Kozik and is a tribute to some of the most popular YA books. 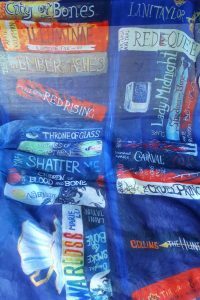 The scarf depicts their spines and I loved finding books I adored and others that are still on my TBR list. Unfortunately, there are a few spelling errors. For instance, one spine reads “Lani Taylor” instead of “Laini Taylor”. But the Fairyloot team has sent everyone an email to apologize and to let us know a corrected version is on its way. Despite these small errors, it’s still an absolutely gorgeous item! Next up, we have another wearable item: a pair of socks. 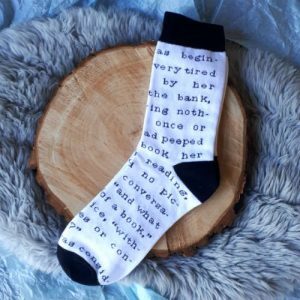 They are inspired by Alice in Wonderland and feature a quote from the book. I’m not the biggest fan of their colour though, especially paired with the black letters. So I probably won’t wear them to go outside, but they’re perfect to stay indoors and read (which is my favourite thing to do anyway!). The next item is a set of page tabs. These are tiny post-its you can stick to the pages of your books when you want to mark something. These are really cute and I love their colours! 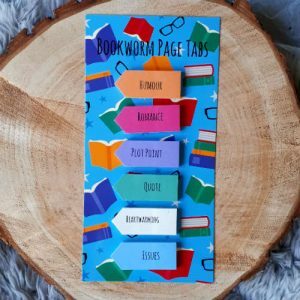 Whether it’s a funny moment, a shocking plot twist, or an inspiring quote, with these page tabs you’re ready for whatever a book throws at you! 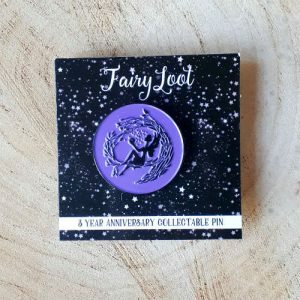 Next up we have a Fairyloot Anniversary enamel pin! 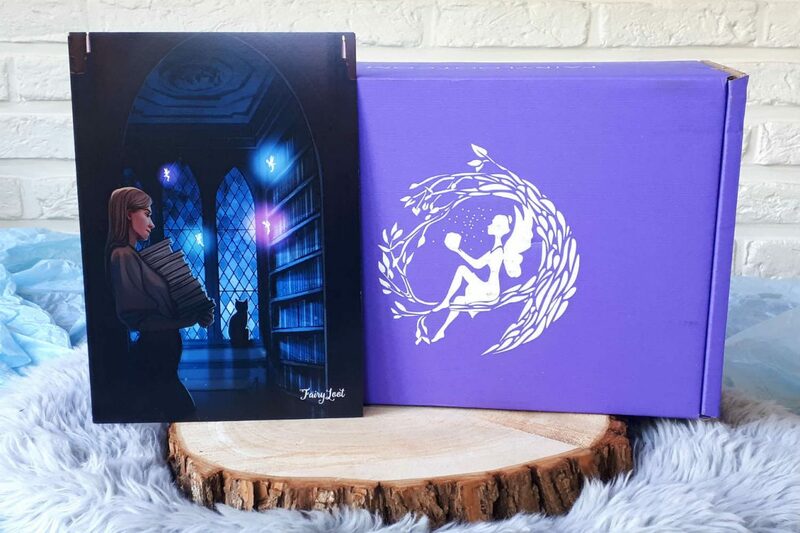 It features the Fairyloot logo on a purple background and I’m in love with this. This definitely deserves a spot on my pin display (which I still need to make)! Let’s move on to the next items, but you might want to take a seat first, because you are not ready for this. Are you sitting down? Good. 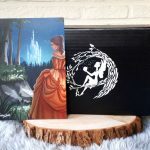 So the next items are… three art prints by Salome Totladze (@morgana0anagrom). I just can’t stop looking at these!!!! The first one shows Laia and Elias from An Ember in the Ashes by Sabaa Tahir. 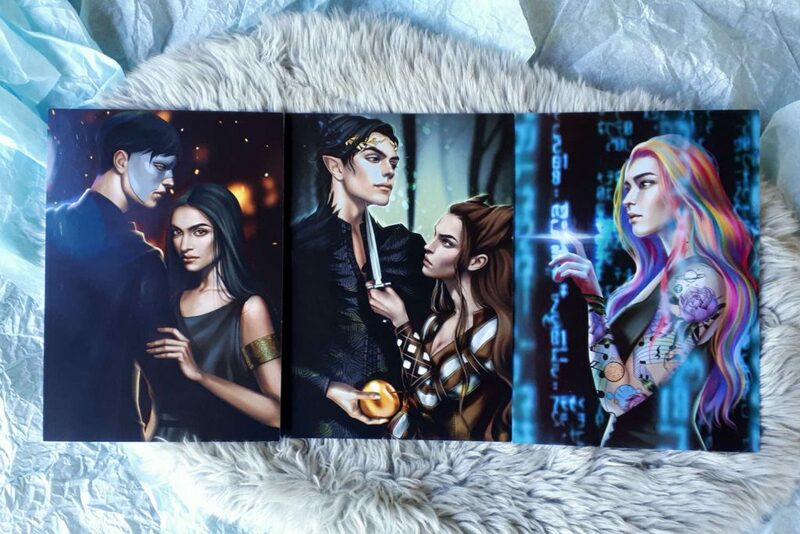 The second one is Jude and Cardan from The Cruel Prince by Holly Black. And the third one is Emika from Marie Lu’s Warcross. I was absolutely floored when I pulled these out of the box. Just look at the details and how she manages to capture these characters in one image! Before we move on to the two books… (Yes, there are TWO books this time! ), there are the trading cards. 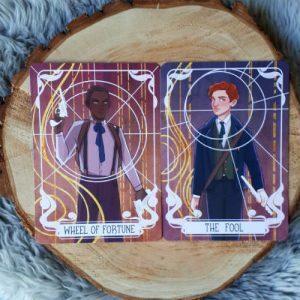 After the ACOTAR cards from the previous months, we have now moved on to the Six of Crows cards. And we start with Jesper and Wylan! It’s honestly impossible for me to pick any favourites from the Dregs. But usually Kaz, Inej and Nina get all the love, so I’m happy Jesper and Wylan (and soon Matthias) also get some attention! 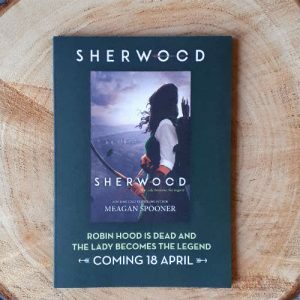 And finally, there is a teaser for Meagan Spooner’s Sherwood. This is a Robin Hood retelling in which Marian takes over the green cloak when news comes that Robin is dead. This teaser includes (part of?) the prologue and a poster with the book’s cover. And there are of course the Fairyscoop newsletter and the bookmark with this month’s artwork. So, as I said earlier, there are two books included in this month’s box. 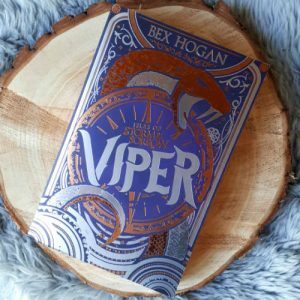 The first one is Viper, by Bex Hogan. It’s a regular paperback, but has an exclusive cover and is signed by the author! It tells the story of Marianne, who is fated to one day become the Viper, defender of the Twelve Isles. But the reigning Viper stands in her way. He is corrupt, merciless… and Marianne’s father. I’m super excited about this one and can’t wait to start reading! And then, the second book! 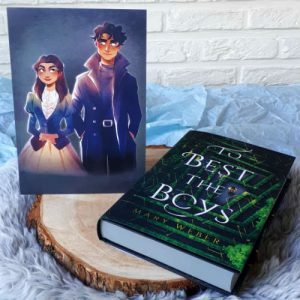 It’s… To Best The Boys, by Mary Weber! This edition has sprayed edges and is signed by the author. The book is about Rhen, a girl who dreams of becoming a scientist and is looking for a cure against the disease that kills the poor people in her town. 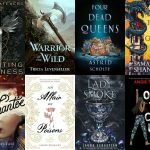 Together with her cousin Seleni, Rhen dons a disguise to enter the labyrinth, an annual competition for boys to win a coveted scholarship. 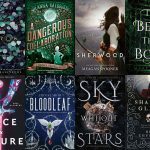 This sounds like The Hunger Games, but with a strong feminist message, so bring it on! As always, the book comes with a letter from the author that features character art on the back. This time, this artwork is by @icandrawthingz. 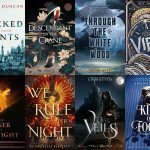 I can’t wait to meet these characters in the book! 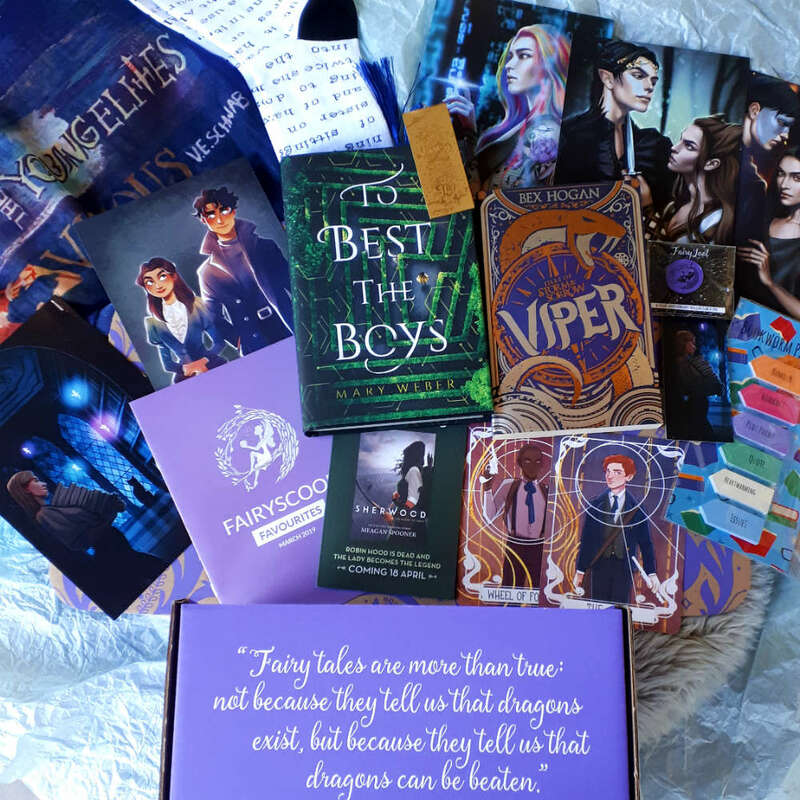 That was everything that came in the March 2019 Fairyloot box! My favourite items were the scarf and the bookmark, and I can’t wait to read these books. What were your favourites? Let me know in the comments below!